Holidays to Djerba up to -70% off To take advantage of these offers, join now for free! Enjoy luxurious holidays to the beautiful African island of Djerba and discover the divine white sand beaches surrounded by crystal clear waters and lined with swaying palm trees. On the largest island of North Africa, located just off the south coast of Tunisia, you will enjoy year-round sun and the tranquility of palm tree fringed beaches. Filled with legends dating back to the time of Odysseus, Djerba offers holidaymakers the opportunity of a lifetime to both relax on serene beaches and explore the setting for the Mos Eisley exterior scenes from the first Star Wars movie. Whilst in Djerba you can keep yourself occupied by visiting the popular tourist destinations of Houmt El Souk, Midoun, Guellala and Ajim. With dramatic sunsets and historical links to Greek mythology, Djerba is the destination you cannot live without seeing. Djerba is well known for its history of pottery, just one of the many cultural activities you can embark on during your visit to this tranquil island. Travel to Guellala and enjoy the fascinating history of pottery that the historical village has on offer. Drop into the museum and learn about the rich cultural background of industry and craft on this island and experience the ceremonies of marriage in Djerba. Also on your itinerary should be Houmt Souk, where you can enjoy a stroll around the little, winding streets and be in awe at the many sights of silk sellers and the colourful spices that are on display around this popular destination. Visit Djerba Explore for a further cultural insight into what makes this strange African island so unique. Let your children feed the crocodiles in the crocodile park or venture through the museum and learn about the history of Djerba. 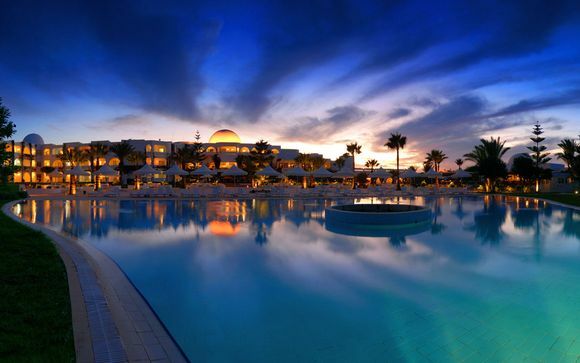 Djerba Explore offers something for everyone, you certainly won't regret paying it a visit. A desert safari is a once in a lifetime opportunity for any family, just remember to take water with you. Climbing on a buggy for a whirlwind adventure through a vast desert in the Mediterranean is a tick off of any bucket list. Or if getting your feet wet is more your style then head to the coast where you can try your hand at windsurfing. If discovering new tastes is more your thing then you can't go far wrong with sampling the delicious Arabic sweets and pastries on offer, including a delicious baklava. Whether you are looking for a relaxing beach getaway or a cultural feast for the senses, our exclusive offers on handpicked Djerba hotels will see you right for a great deal, with particular thanks to our exceptional discounts. Last minute deals to Alicante, the Spanish port city!